As libraries evolve to fulfill an expanded social role, the Brooklyn Public Library tasked us with examining how their branches can be inclusive of the unique needs of their patrons, including both incarcerated and re-entry citizens. For vulnerable populations the first experiences with the library are critical; they can decide whether or not an individual continues to engage with the services and resources it provides. 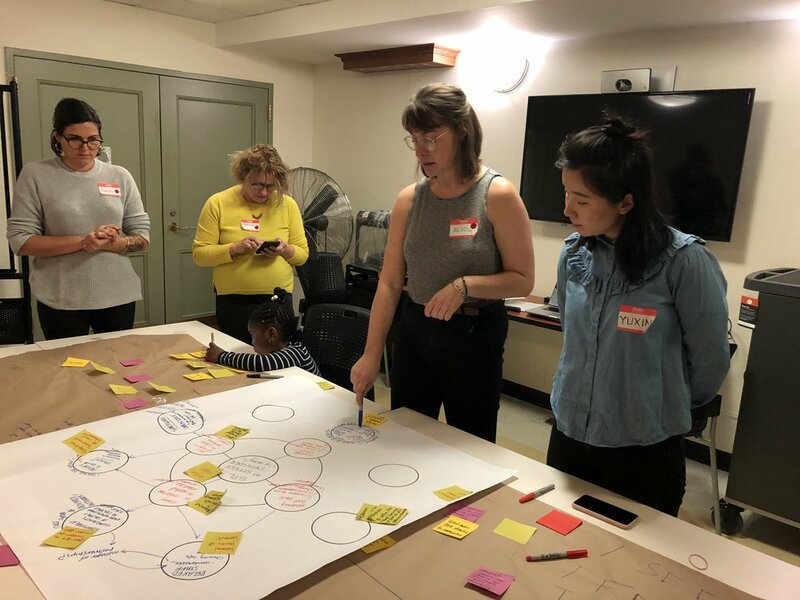 Over the course of the semester, our group worked to research the current operations at the BedStuy branch and the evolving role of the library. Our group focused on organizational change, and invited members from different BPL branches, those in management, and stakeholders, including community based organizations and those with family who are or have been incarcerated to be a participant in a design workshop. Our goal for this workshop was to uncover the perceptions of the library, the role of staff within it’s current organizational structure, and uncover potential areas for interventions. When designing the workshop, we divided it into 3 parts: Video Ethnography, Identifying Assumptions, and Envisioning Futures. During this portion, we utilized video interviews the DESIS lab had completed to prompt conversations about the role of libraries today. With a mix of employees, users, and related organizations present, we were able to bring to light the expectations, realities of staff, and hopes of those there. Next, we completed a card sort which tasked participants with placing cards based on how they see, hear, and feel about library. When placing the card, participants were asked to explain their reasoning and discuss with each other why that was so. Finally, we used the findings from the previous two parts to co-create a futures wheel. The futures wheel places a main focus in the center, and spirals out based on findings and envisioning what could happen next.